Last time I was writing about the excellent (if a bit geeky) maps produced by the USGS. However great its series are, they might be a bit too “raw” for casual users and, most importantly, unlike OS Explorer they don’t mark walking trails (this should change with the new editions where adding trails is planned, at least in areas administered by the Bureau of Land Management, Forrest Service and National Park Service). Some old 1:24,000 quadrangles show paths but they don’t indicate if there is a right of way along it. And we all know about US gun laws. For trails you need the Trails Illustrated maps produced by the National Geographic. These are excellent walking maps with full topographic content but also marking trails, campgrounds, visitor centres, even toilets. They are also printed on waterproof plastic. Unfortunately they only cover national parks and some of the most popular national forests. For National Forests not covered by the Trails Illustrated maps there is usually the possibility of obtaining maps produced by The United States Forest Service. Most of these maps are at a scale of 1:126,720 and many others are at scales such as 1:63,360, etc. These maps are famous for showing the numerous Forest Service back-country roads and they provide forest-wide information on attractions, facilities and services. However it is worth mentioning that many of those maps (especially the smaller scale ones) lack contour lines. Interestingly USDA Forest Service is also producing its own series of 1:24,000 quadrangles, called FS Topo. They are broadly similar to the US Topo series but they don’t contain the orthophoto image layer. Their advantage is that, unlike the US Topo series (at least so far), they do show trails as well as numbers for the forest roads. They can be downloaded for free as a Geo-enabled PDF file from the Forest Service website. 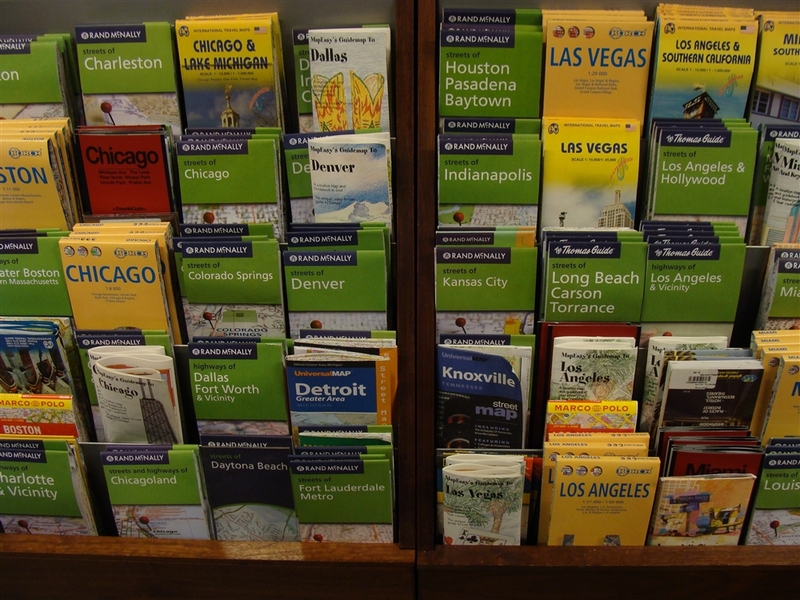 Now, a few words about road maps and general maps in America. There is of course a huge choice of road maps for the whole USA, its regions, states or even particular counties. There are so many of them that it is actually pointless to even try to list them here. Especially as most of them are quite average, nothing really to shout about. 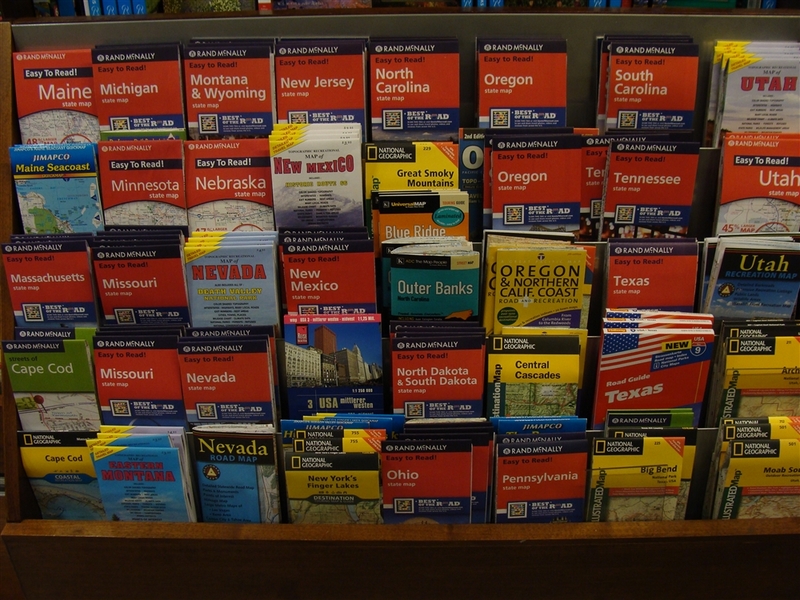 One company worth mentioning is Rand McNally which publishes road atlases for the whole country, road maps for each state and city maps. It is one of the most well-known and oldest map makers in America. It produced its first map in 1872, it was published in its “Railroad Guide”. The first Rand McNally road map was published in 1904 and in 1917 the company was the first major publisher to embrace a system of numbered highways. In addition to creating maps with numbered roads, Rand McNally also erected many of the actual roadside highway signs. This system was subsequently adopted by state and federal highway authorities. So the pedigree is there, but its maps are no more or less accurate than any others. Some of my favourite road map publishers are GTR Mapping and Benchmark Maps. Both companies specialize in mapping western United States, in fact they don’t venture into the eastern half of the country at all. The best aspect of their maps is the fact that unlike most of the road maps in America they do show some topographic and landscape information. 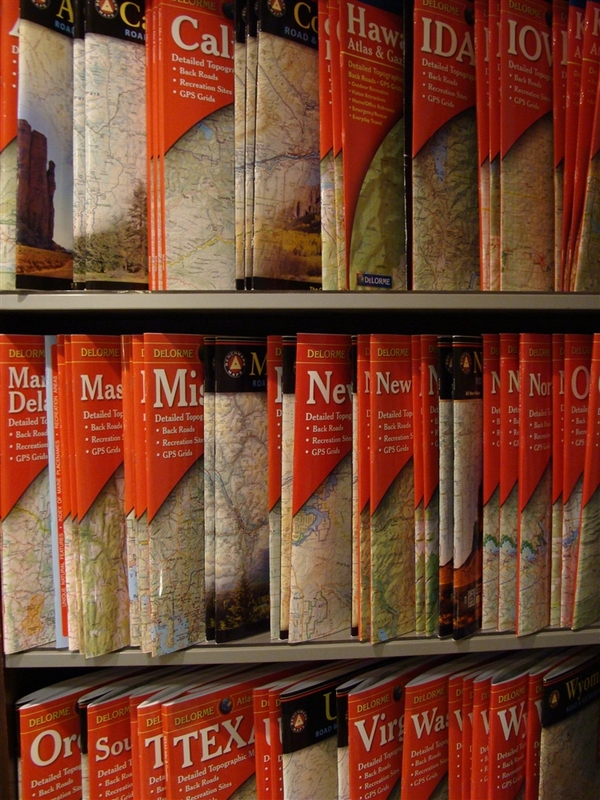 For those for whom the road maps are not enough but who don’t want to embrace the slightly geeky world of the USGS maps there is one more option. 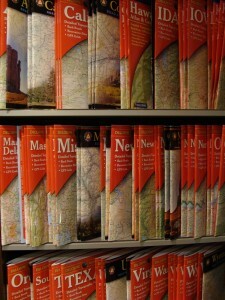 Maine-based DeLorme produces a series of Recreational Atlases & Gazetteers for all the states. These excellent atlases feature detailed topographic maps for the entire state in handy atlas form. Each atlas features the most up-to-date road information for the state, from interstate highways to dirt logging roads (including names of the smallest lanes and numbers of the forest roads). The maps also show an abundance of geographic features and landmarks, information on places to go and things to do, all cross-referenced to the map. The scales vary depending on the state. For some of the smallest ones (like Connecticut or Rhode Island) it can be as large as 1:65,000 but most of the states fall into the 1:150,000 – 1:250,000 category. I love using them even if I don’t need all the detail they provide. One more item which I really have to mention here is: “USA: The Essential Geography of the United States of America” produced by Imus Geographics. It is an absolutely fantastic, 1:4,000,000 map covering the whole country. It has relief shading based on the satellite imagery, clearly showing the country’s topography with plenty of names of geographical features. For example it marks the highest point in each state (including elevation in feet), which is a geek’s dream come true. Colouring indicates forested regions and the map shows boundaries of national parks, forest and other protected areas and Indian reservations. It is also one of the few maps of the USA showing route 66 clearly marked. It is a great map for the overall general planning or just for dreaming about the distant trips. So this is US mapping in a nutshell. I could of course write much more, listing some small publishers or going into technical details of the USGS mapping, but that is enough for now. If you have any more questions feel free to ask. This entry was posted in Uncategorized and tagged atlases, Benchmark Maps, DeLorme, GTR, maps, Rand Mcnally, Trails Illustrated, usa on August 7, 2013 by admin.